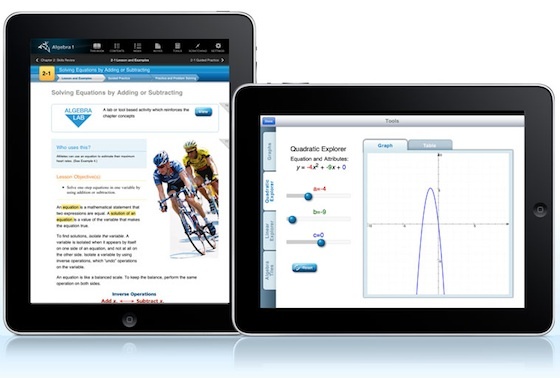 Publisher Houghton Mifflin Harcourt announced the results of its "HMC Fuse: Algebra I" pilot program at Ameila Earhart Middle School in California's Riverside Unified School District. Algebra I digital textbook is the world's first full-curriculum algebra application developed exclusively for Apple's iPad. The program helped more than 78 percent of students score "Proficient" or "Advanced" on the spring 2011 California Standards Test. That was significantly higher than the 59 percent of peers who used traditional textbooks. Earhart math teachers Dan Sbur and Jackie Davis were among the first to use the new digital tool on Apple's iPad. Both said they were encouraged by the initial run and the positive effect it had on students' scores. "Students' interaction with the device was more personal," Earhart Principal Coleman Kells said. "You could tell the students were more engaged. Using the iPad was more normal, more understandable for them."